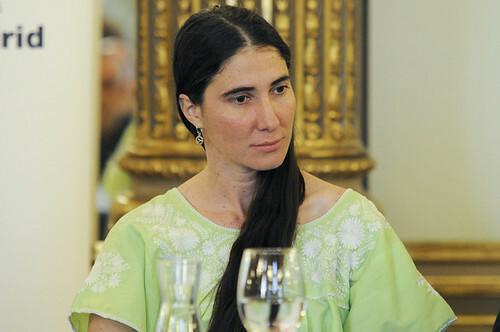 Yoani Sánchez. Photo: Casa de América via Flickr. Prominent blogger Yoani Sánchez said she plans to launch a digital newspaper in her native Cuba. The announcement took place on Jan. 31 during the Hay Festival, in the Colombian city of Cartagena. Sánchez is a dissident blogger who gained prominence in 2008 with her blog “Generation Y” where she often writes about the Cuban government and life in the island. “I want to go from having a personal project, like my blog … to having a collective and responsible project, with a focus on helping Cuban society in their transition, a transition without violence, without revenge, where the people are informed enough to be able to decide," Sánchez said during a debate at the festival, according to El Nuevo Herald. She added that she is not looking to create an opposition newspaper, but a outlet that creates consciousness through information and offers hard news as well as opinion columns. Sánchez, who is also a delegate of the Inter American Press Association (IAPA), said there were some fears over worst case scenarios -- like being the target of a police crackdown on the day they launch or having their internet access blocked -- but remained hopeful they would have a smooth launch. The announcement was well received by the audience in the festival, a sharp contrast with the threats she received at the end of January when the Community of Latin American and Caribbean States Summit took place in La Habana and the Cuban government launched a massive repression campaign against dissidents. Sánchez has almost a million followers on Twitter, and her blog has been translated to 15 languages. In 2008 she won the Ortega y Gasset journalism award, which she wasn’t able to accept due to the Cuban government denying her permission to leave the country. In the same year she was featured on Time Magazine’s list of 100 most influential women in the world.